Mahatma Gandhi challenged the British Rulers in India in 1942 with the simplest but powerful of all his sayings 'Quit India' to the British Raj and 'Do or Die' to the people of India. This historic call came from Gandhi on the 8th of August 1942 in Bombay. Before going to the details of the movement, one should understand the circumstances led to this final call. The Second World War was started in 1939 and it involved all of the great powers -eventually forming two military alliances: the Allies and the Axis. Linlithgow, the then Viceroy, without consulting the elected provincial Governments in India, declared India at war with Germany on 3rd September 1939. The Congress objected it very strongly. The Working Committee of the Congress met, discussed and suggested that it would cooperate if there were a central Indian National Government formed, and a commitment made to India's independence after the war. The government turned its blind eye. The Viceroy Linlithgow could only offer to form a 'Consultative Committee' for advisory functions. The dissatisfied Congress tendered its resignation on 22nd October 1939. Gandhi was busy in the constructive activities especially on campaign against untouchability from 1933 onwards. These circumstances, brought back Gandhi again into active politics. Gandhi and Congress were not satisfied with the Government's offer which envisaged that after the War a representative body of Indians would be set up to frame the new Constitution and therefore Gandhi decided to launch Individual Satyagraha. Individual Satyagraha was limited, symbolic and non-violent in nature and by which select individuals were to declare publicly that 'It is wrong to help the British war effort with men or money. The only worthy effort is to resist all war with non-violent resistance.' It was left to Mahatma Gandhi to choose the Satyagrahis. Acharya Vinoba Bhave was the first to offer Satyagraha on 17th September 1940 at Wardha and he was sentenced to three months imprisonment. Jawaharlal Nehru was the second Satyagrahi and imprisoned for four months. The individual Satyagraha continued for nearly 15 months. The British Government led by Winston Churchill was in a fix and forced to act to curtail the irresistible invasion by the Japanese in the South East Asia. He decided to send his War Cabinet Labour Party colleague Sir Stafford Cripps to India with an 'agenda'. The selection of the emissary of the British Government was cleaver and diplomatic. They have chosen a vegetarian, socialist and an Indian sympathizer for this mission, popularly called 'Cripps Mission'. Cripps arrived Delhi on 22nd March, 1942 and met the leaders of the Congress including Gandhi. Gandhi had disillusioned with the draft and called it as 'post-dated cheque'. He advised Cripps to take the next plane to home. On 12th April, Cripps returned empty handed. American writer Louis Fisher was in India and stayed in Sevagram, Wardha to understand the mind of Gandhi. He also met all other leaders including Jinnah. Gandhi has written a letter to Franklin D.Roosvelt, the President of America and asked Louis Fisher to deliver safely to him. Gandhi said in this letter, "In order to make my proposal fool-proof I have suggested that if the Allies think it necessary, they may keep their troops at their own expense in India, not for keeping internal order but for preventing Japanese aggression and defending China. So far as India is concerned, she must become free even as America and Great Britain are. The Allied troops will remain in India during the war under treaty with the Free India Government that may be formed by the people of India without any outside interference, direct or indirect." The propaganda machinery of the British was in full pitch during this period and sent all negative images of Gandhi, Nehru, Azad to the Americans. But at the same time there was also group of people in America supported Gandhi's action by negotiating with President's lobby. Mahatma Gandhi in his speech delivered on August 7th, 1942, a day before Quit India Movement started, showed the way to the British 'Quit India'. Quit India Movement was the final call to end the British Raj in India. Through this speech he waged a non-violent war against the British. But he was very cautious in his approach. While introducing the resolution Gandhi said, "Before you discuss the resolution, let me place before you one or two things. I want you to understand two things very clearly and consider them from the same point of view from which I am placing them before you. There are people who ask me whether I am the same man that I was in 1920 or whether there has been any change in me. You are right in asking that question. I may tell you that I am the same man today that I was in 1920. The only difference is that I am much stronger in certain things now than I was in 1920. "There are people who have hatred in their hearts for the British. I have heard people saying that they were disgusted with them. Common people's mind does not differentiate between British Government and British people. To them both are the same. They are the people who do not mind the advent of the Japanese. To them perhaps it would mean change of masters. But it is a dangerous thing. You must remove it from your mind. Gandhi invited the people to join the movement. Gandhi said, "My democracy means every man is his own master. I have read sufficient history and I did not see such an experiment on so large a scale for the establishment of democracy by non-violence. Once you understand these things you will forget the differences between the Hindus and the Muslims." 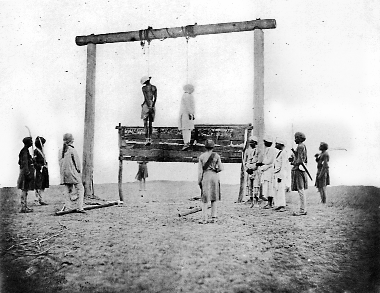 Our fight was purely a non-violent fight for India's independence and self-governance. In a violent war, a successful general has been often known to effect a military coup and to set up a dictatorship. But under the Congress scheme of things, Gandhi himself explains that "A non-violent revolution is not a programme of seizure of power. It is a programme of transformation of relationships." Gandhi's non-violence was in test. Government wanted to crush the movement under its authority. Government decided the course of action even before the launching of the movement. When it received the message that the AICC approved the Quit India Resolution, they send signal to all the Provincial Governors, Chief Commissioners and Political Presidents in Princely States to act according to the plan all over India in a systematic way. It was ordered to arrest Gandhi and all members of the Working Committee, All India Congress Committee and Provincial Committee. It was declared by the Government that Working Committee, All India Congress Committee and Provincial Committee as unlawful organization and seizes their office and funds. Armed forces were effectively used to put down any demonstration, agitation, mass meetings and marches. Without giving any reason the local officers can arrest anybody and put them in jail under the martial law. Almost the entire Congress leadership, and not merely at the national level, even at the grass root level was put into confinement less than twenty-four hours after Gandhi's speech, and the Congress leaders and volunteers were to spend the rest of the war in jail. Gandhi, Patel, Rajendra Prasad were arrested along with Kasturba, his Secretary Mahadev Desai, and Mirabehn. Nehru was ready to give a speech for broadcast to United States, but he was arrested in the early morning. Maulana Azad was busy in the early morning in drafting a covering letter to the President Roosevelt but he did not allowed to finish the letter and arrested. This was the turning point in the movement. Gandhi, second line leaders and provincial leaders were all in jail. Nobody was out to guide the movement. It was totally unorganized and some of the leaders went underground. Misguided and ill-informed mob went to destroy the places like police station, railway station, post offices and cut down the telephone lines. Government blamed Gandhi that it was a deliberate attempt to dislodge the British Rule in India and justified the action of the Government against the unruly behavior of the mob. It pained him. All along he experimented non-violence as a powerful political tool to settle the conflict. But at the final call, our own people disappointed him. He went on fast for 21 days from February 10, 1943 to March 3, 1943 in the Aga Khan Palace, Pune, where he along with his companions jailed as prisoners. Somehow Gandhi's fasting message reached the people. One of the underground activists and later became the Chairman of the Gandhi Smarak Nidhi, R.R. Diwakar narrated his dilemma during this period. He said, "I felt all along that these subversive activities, and even going underground, were not strictly Gandhian…. Though I was neither inclined nor capable of being an underground worker, I had to do it in order to give some guidance and help to workers… But I emphasized that though violence to government property was aimed at and was inevitable our workers were warned to see that strictest possible precaution was taken to avoid even a semblance or threat of violence to persons." But Gandhi observed that the violence to property was sure to lead to violence to person, sooner than later, by the workers or by the government. Being underground and without necessary communication with workers, no one be able to control the situation. After the arrest, Gandhi and others were kept in Aga Khan Palace. The health condition of the Mahadev Desai was deteriorated he died as a martyr on August 15, 1942. Gandhi was affected by the sudden death of Mahadevbhai who was like his son. Another shock to Gandhi came when his wife passed away, her head resting in Gandhi's lap, in the same jail on February 22, 1944. Kasturba married to Gandhi at the age of 13. More than six decades they were together. Together they faced so many ups and down in their personal and public life. He felt vacuum around him and felt lonely. Gandhi's health was also deteriorated. On the health ground Gandhi was released from the Aga Khan Palace in Pune on May 6, 1944. Gandhi declared on 28 July 1944 that all underground activities were tantamount to violence. He preferred underground workers to offer themselves by some open defiant action and get arrested by the government. Second World War ended with the unprecedented death of lakhs and lakhs of people when America dropped its baby bomb on August 6 and 9, 1945 in Hiroshima and Nagasaki. Allied Forces emerged as victorious. Great Britain saved her territories. Now they were forced to decide on Indian question. The way the British treated Indians during Salt Satyagraha and Quit India Movement created a negative impact on the British Rule both within and outside India. Public opinion was mostly in favour of Gandhi and Indian Freedom Struggle. American President Roosevelt also put the pressure on British but unfortunately he died on April 12, 1945. Harry S. Truman, who was the Vice President, became the President of the United States. He also followed the same line as Roosevelt on the question of Indian Independence. There was also a fragile argument to disrespect and discredit the mass awakening by Gandhi that the huge expenditure incurred by the British during the Second World War led to the decision to give Independence to India. In fact, British should have kept India like a colony which has a big market for recapturing their economy. Gandhi also rejected yet another argument that it was sabotage and underground activity which had strengthened the national cause or brought freedom to India. Finally British decided to negotiate Independence to India by sending the Cabinet Mission to Delhi. The authorities of the British both in Delhi and London worked out the plan of dividing India during 1942-45. Congress accepted the plan to divide India and with lot of pain Gandhi also accepted. As Gandhi visualized and predicted, the freedom to India paved way to the freedom to most of the colonies of Asia and Africa. As Queen Elizabeth in her speech at Philadelphia on the occasion of the United States Bicentennial said, "the British lost the American colonies in the eighteenth century because we lacked that statesmanship to know the right time, and manner of yielding what is impossible to keep." Gandhi taught this statesmanship to the British with his gentle non-violent approach and thus created a conducive atmosphere to the British to quit India with dignity and honour at the right time. He asked the Indian people 'Do or Die'. Mahatma did and died.